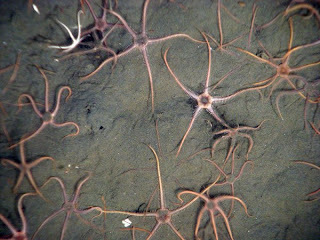 The Echinoblog: When Brittle Stars ATTACK!!!! : The Ophiura sarsii DEATH MATCH!! 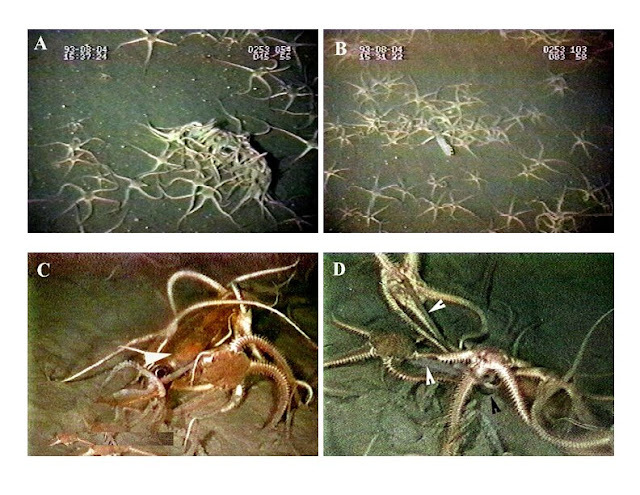 When Brittle Stars ATTACK!!!! : The Ophiura sarsii DEATH MATCH!! Back in 1996 at the International Echinoderm Conference hosted by Rich Mooi in San Francisco, there was one talk given that was SRO, and had a huge crowd of people billowing out of the door. It was a remarkable presentation that for the first time showed VIDEO of what could only be called "When ophiuroids ATTACK!!" presented by Steve Stancyk, C. Muir (University of South Carolina) and Toshihiko Fujita (National Science Museum of Tokyo). All images below provided by Steve. thanks! 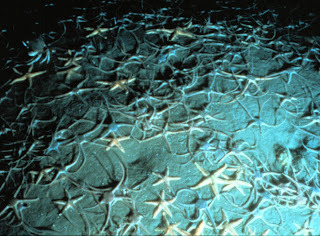 They showed these innocuous benthic residents-Ophiura sarsi in a new light. These beasties can occur in some places in great density around the world...West Atlantic, North Pacific (Japan) and elsewhere along the continental shelf and deeper. It was thought that they had been holding up their arms in these sorts of aggregations (300-350 sq. meter) in order to suspension feed. Passive, laid back and docile. There was gut content material from fish and squid..but SURELY that HAD to be from fallen detrital rain?? What OTHER explanation could there be?? It turns out that this species could actually catch SWIMMING prey!! It happens quite frequently that some squid, fish or euphausid swims too close or too low to the bottom...and O. sarsii can have a reach of almost 5 cm off the bottom. In one instance where myctophid fish were moving near to the bottom, they would literally be caught by an arm loop on one animal, followed by a huge attack!! The fish would be JUMPED by a huge CLUSTER of ophiuroids!! One would grab hold and the others would PILE ON. Here are images of different prey: This one shows a Japanese population of O. sarsii attacking a fish, shown trying to escape! These show closer pix of a fish off the coast of Japan caught by O. sarsii. Note the eye of the squid in the pic above. What the ophiuroids DO to the captured prey is brutal. They use their arm loops to literally REND the prey (squid, fish, etc. )...APART while it is alive. According to a paper by Stancyk et al. 1998 (from the San Francisco IEC Proceedings 1998, pp. 425-429)) sometimes up to SIX brittle stars were actively holding onto a squid during feeding. Now, realistically, this species catching prey, probably doesn't happen too often. But do they need to? How much nutrition does one of these impart to this system? BUT Wait!! It gets better! This species isn't the only one that feeds this way!! Remember this species from New Zealand? Ophiopsammus maculata?? And how motherfrakking big it is?? These apparently have a similar posture...so MAYBE they also feed in this way???? Can you imagine that?? A big cluster of ophiuroids, EACH ONE- the size of a dinner plate jumping on top of some FISH (or ????) and then BRUTALLY tearing it apart into little pieces?? I was at Steve Stancyk's talk at the 1996 IEC in San Fran, and I was blown away at the video of Ophiura attacking passing squid!! How GREAT is that?! I love telling people about the video showing ophiuroids that gang up and attack swimming prey. Hard to believe it can happen, but I saw it myself. Wish I could get my hands on a copy of the video! Pycnopoda Video-short but oh-so sweet! 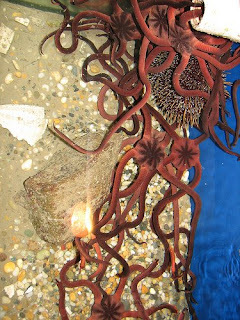 The Big Echinoderm Big Book Blog!!! Sea Urchins Video Insanity Thursday!! The Flickr Field Guide Challenge!